There is no shortage of options to create an online store these days. But doing it for free? Not actually that simple. The choice in platforms is limited, and on top of that, you have to do without some of the features reserved for paying users. So we thought we’d investigate the best free ecommerce builders out there. In each paragraph below you’ll read about their pros and cons, and our general experience with the platform. 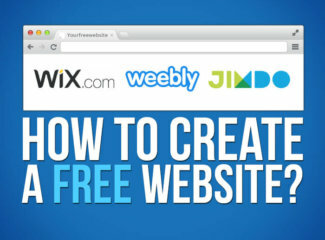 Known primarily for their website builder, Webstarts also lets you add an online store for free. It is, in general, a very generous free plan. This is probably why 4M users rely on it for their online presence. Now, creating the store is also a pretty smooth experience. If you’ve ever used Wix, the feeling is very similar, as you can move items easily on the page. You can also adapt them for mobile screens, as templates aren’t automatically responsive. The interface is a bit dated, but it’s not bad for a free offer. 1Gb of space: enough for a decent selection of items. Sell everything: you can sell digital items and physical goods. Generous free plan: sell 10 products and make up to 20 sales a day. More than most small stores will need. Unintrusive advert: it’s in the footer and doesn’t look obnoxious. Good payment options: Stripe, WePay, Authorize.Net and PayPal are supported. SSL is not free: it costs $8 a month and it’s highly recommended for ecommerce. No SKU: but you can track your inventory. No SEO options: title tags, descriptions & personalized URLs for products and categories are missing. 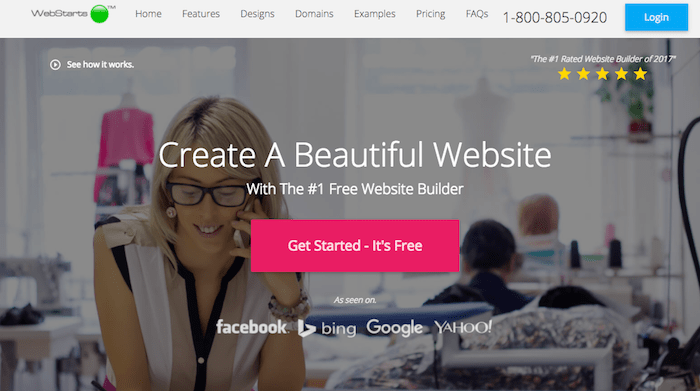 A website builder with 20+M users and more than 200K online stores to their name, Jimdo is solid, reliable and easy to use. The free plan shows a small ad, and if you decide to go premium later, their plans are very affordable. For the free ecommerce plan, you get basic features and 5 products. Maybe good for an artisan store or someone who only sells limited edition items. The good thing is that if you ever need to upgrade to a paid plan, they are very affordable starting at $10 per month. 500MB of storage: enough to have a good amount of text and images to accompany your products. SSL included: accept payment safely. Intuitive and easy to use: perfect for beginners who don’t want to dwell on the technical details of building a site. Physical goods only: can’t sell services or digital downloads. Credit card payments only via PayPal: in order to use Stripe you’ll need their BUSINESS package. Not to be mistaken with Mozilla, this small Latvian company isn’t a household name, but they have one feature that big companies don’t: multilingual websites for free. The same applies with their online store offer. Free deal, multilingual options. You can sell up to 10 products. Unfortunately, working with their editor isn’t as fun or flexible as we’d like. For instance, you can’t add image galleries to all the pages. 500MB of storage: good for small stores. Multilingual option: you can sell in numerous languages. Inventory tracking: good for replenishing stocks. Basic system: your ecommerce will be pretty unsophisticated. No SSL: you’ll have to add it yourself. Physical goods only: you can’t sell digital products. No credit card payments: Stripe only comes with premium plans. Squareup comes from Square, the famous Point of Sale system available for smartphones, desktops and tablets. It is like a portable version of your store that can be used to sell and manage payments everywhere with Internet. Since they process online payments (for example Weebly uses them), you can also create an account with Square and open a free online store. It’s not the most obvious solution, but it works! You can sell your items in person, and also on the web. You don’t have to pay monthly fees, but they take 3% of every transaction. Great P.O.S: obviously, combining your online store with Square is what makes it appealing. You can sell all kinds of things face to face, from services to concert tickets. Sell tickets: Square’s system comes with a feature to sell event tickets. Inventory tracking: manage your stock easily. Optimized for physical store owners: if you don’t have a brick and mortar establishment, maybe not so interesting. Poor SEO options: no title tags or customizable URLs, amongst others. Limited payment options: PayPal isn’t supported, for instance. Freewebstore displays the number of store owners who chose their product on their landing page. At the time of writing, it’s around half a million users. Their motto “eCommerce for everyone” seems to make sense for a lot of people. It’s certainly not a bad deal as you can sell up to 20 products for free, and SSL is included. The designs are ok, if a bit dated, but they are responsive for mobile phones and tablets. Numerous online payment processors: Stripe, PayPal, Skrill, 2Checkout and more are included. Advanced features: import / export products via CSV and abandoned cart, amongst others. Dated and complex backend: it’s not exactly intuitive or fun to create the site. Physical goods only: can’t sell digital products online. Strikingly’s mission is to let you “build your brand” and “conquer the world”. Apart from that, there’s not much information about them online, except that their product is free and includes a web store. The main catch is that you can only sell one product for free. Also, they only let you create single-page layouts. This isn’t bad if you want a minimalist website, but not great for SEO. Let’s see more of their pros and cons below. Good designs: they are modern and responsive. Numerous online payment processors: PayPal, Stripe, and offline payments are accepted. Only sell one product: you have to pay to sell more. Limited template choice: limited for the websites, and there are even fewer for ecommerces. SEO-limitations: mostly due to the one-page template. Find out more in our Strikingly Review. A young Dutch provider in the ecommerce scene, MyOnlineStore has a small staff of 24 and around 40 000 stores to their name. Good designs: modern and responsive. Payment options: online and offline are supported. Even Bitcoins! Multilingual system: to create your site in your preferred language. Still in Beta stage: maybe MyOnlineStore needs a bit of time to grow. Something a little different here, as the strangely named Ecwid is actually an ecommerce plugin you can add to any website. It’s a very interesting proposition that has won nearly 1M people over. The free option lets you sell 10 items, and the plugin is available in 50 languages. As you can read in our complete review, it’s a perfect mix between a dedicated ecommerce solution and a budget online store. Indeed, the premium prices are reasonable if you choose to upgrade from the free option. Powerful features: even the free option lets you set taxes, manage articles and create coupons, amongst others. 20+ payment processors: PayPal, 2Checkout, Authorize.net and many more. Intuitive and easy to use: the interface and user experience are top-notch. Sleek product presentation: carousels, galleries, you get tons of options to display your wares. You need an existing website: you need to take that into account for your costs and ease of use. SEO could be cleaner: for example, Ecwid adds product IDs to the URLs. You might already know that you can use WordPress for free, and the good news is that their most popular plugin for online stores is also gratis. WooCommerce is a fantastic tool that lets you do everything that big online stores can. One thing to mention is that WordPress doesn’t come with free hosting, so you might still have to pay a bit. It is possible to find free hosting providers (like 000webhost), but don’t expect the best uptime and speeds from them. You can read our complete review of WooCommerce here, but the main takeaways are that it’s incredibly powerful, but not exactly a cinch for beginners. Powerful features: there isn’t much you can’t do with WooCommerce. Great for SEO: all the options you could want here too. Works well for large stores. SSL integration (if your web host allows it). Very technical: WooCommerce isn’t exactly easy to set up. Need to use WordPress: and be fairly proficient at it. That also means finding your own hosting provider. No support: you only have the forums to trawl for information. Can become costly: WordPress in general can be a money pit if you buy extra themes, plugins and developer time. What will I miss with a free online store? Selling online can be difficult if people don’t trust your business, and the main problem here is with the domain name. Most free online stores won’t get you a .com or a .net. These always cost money. Instead, you’ll piggyback on the provider’s domain, so your store URL will be something like: www.yourname.freecommerceplatform.com. Providers who offer free online stores also make up some of the cost by selling advertising space. Most of the time it’s just for their own platforms, but sometimes it’s for other services. In any case, adverts don’t look super professional. Finally, you’re pretty likely to miss out on features. Most providers will reserve their best templates or options for paying users only. Likewise, SSL, or secure encryption is a must-have for online stores, and you won’t always get it for free. Why are they offering free stores? Good question. Most of the time, the platforms operate on a freemium model. Your basic site is free, but when you want to expand (add more products for example,) you have to pay. And you’re more likely to choose the easy options of paying a bit more with the same provider than moving your entire store to a cheaper host. This is why we recommend you take into account the premium plans as well as the free ones. It might be highly beneficial in the long run. If you are serious about ecommerce, we’d suggest you to check our store builder comparison tool to find the best solution for your project. Is my SEO going to be OK with a free ecommerce builder? In all likelihood, your SEO will suffer. Non-custom domain names are a big problem with search engines like Google. We can’t guarantee that you won’t rank with a free solution for a very specific niche, but if you’re set on acquiring customers via Google, you’re better off paying for a custom domain at least. Free online stores should be considered for test runs. Maybe your sales will take off, and you’ll need to move to a better provider. Maybe you’ll need to add more products and expand. In any case, they are not recommended for serious, long term online stores. Weebly, Shopify and BigCommerce are much better solutions for ambitions ecommerce owners. Finally, also remember that just because you build it doesn’t mean they’ll come. If you are going to rely on organic search results to bring in customers, a paying online store solution with better SEO options is a must. If you have any questions, please leave us a message!